Lets explore a sophisticated color palette featuring soft gray and ivory tones accented by bold punches of burnt orange and terracotta. Dimension is achieved through fun patterns, such as the iron gate design, embossed crocodile and abstract spirograph as highlighted above. 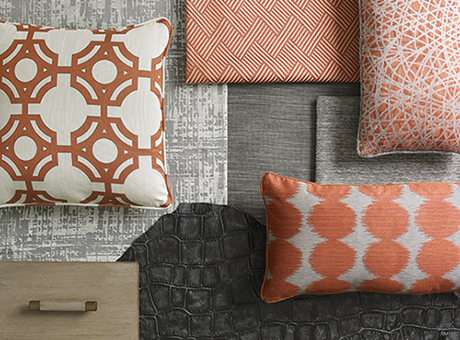 Geometrics are proving hot as is highlighted by the bold circle and structured zig-zag patterns. In more casual environments, we are seeing pops of colors added through the use of accent pillows and chairs, again keeping the foundation in a neutral tone, as shown above in a soft ivory coloration. Hints of metallic are added throughout the room through nailhead on the ottomans, as well as the metal accents on the cocktail and lamp tables. 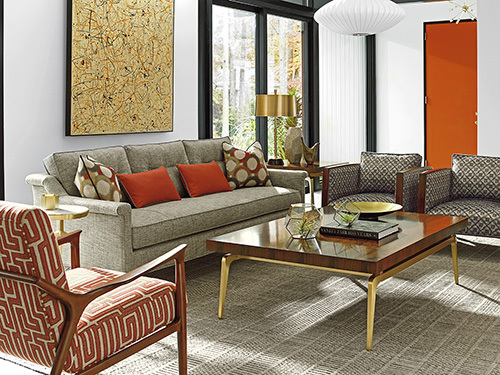 Finally, we see the last setting showcasing the use of terracotta in a fun geometric pattern on a mid-century modern chair while a bold orange is used as an accent on the door and pillows. Keeping the walls ivory and adding metallic touches keeps the room feeling refined.